The Osmond Brothers appeared on the Andy Williams Show which aired on this date. They sang Bye Bye Blues and Aura Lee with Andy Williams. George Gobel and Keely Smith were also guests on this show. The Osmond Brothers appeared on the Andy Williams Show which aired on this date. They performed a Music Medley with four different songs, and then combined them all into one. Jane Wyman, Jonathan Winters, and Red Norvo were also guests on this show. The Osmond Brothers appeared on the Andy Williams Show which aired on this date. They performed Ballin' The Jack and a number with the Clinger sisters from Utah, These Will Be The Good Old Days. Sammy Davis, Jr. was also a guest on this show. Donny made his debut on the Andy Williams Show. He sang Yes Sir, That's My Baby. Ann Southern, Lorne Greene, Dan Blocker and Bob Hope were also guests on this show. The Osmond Brothers appeared on the Andy Williams Show which aired on this date. Peter Lawford, New Christy Minstrels and Martha Raye were also guests on this episode. The Osmonds performed Mobile and I Want To Be In Chicago Town. The Osmond Brothers were guests on the Andy Williams Show which aired on this date. Guests included Andy Griffith and Al Hirt. The Osmonds performed Row, Row, Row. The Osmond Brothers were guests on The Andy Williams Show which aired on this date. Guests included Fred MacMurray and Carol Channing. The Osmonds performed Let's Harmonize with Andy Williams. The Osmond Brothers were guests on The Andy Williams Show which aired on this date. The Osmonds performed If You Knew Susie, Like I Know Susie and I Want A Girl Just Like The Girl That Married Dear Old Dad with Andy Williams. Other guests included Shelley Berman and Rita Moreno. James Arthur Osmond was born to George and Olive on this date in Canoga Park, CA. The Osmond Brothers were in the recording studio recording Kentucky Babe, Be My Little Baby Bumblebee, Keep Your Eye On The Girlie You Love, Just A Song At Twilight, and Mighty ‘Lak A Rose for their first LP, Songs We Sang On The Andy Williams Show. The Osmond Brothers were in the recording studio recording Bye Bye Blues, By The Light Of The Silvery Moon, Down Our Way, In The Good Ole Summertime, and Aura Lee for their forthcoming LP, Songs We Sang On The Andy Williams Show. The Osmond Brothers recorded Take Me Back To Babyland and I Wouldn’t Trade the Silver In My Mother’s Hair for their forthcoming LP, Songs We Sang On The Andy Williams Show. The Osmond Brothers first album, Songs We Sang On the Andy Williams Show was released on the MGM Recording Label. Preview of The Travels of Jaimie McPheeters LP was released. Note: This album contained songs from the Songs We Sang On Andy Williams Show. The actual song, Travels of Jaimie McPheeters, was not on this album and was not recorded until August 19, 1963. It was released as a single in October 1963. The Osmond Brothers single, Be My Little Baby Bumblebee / I Wouldn’t Trade The Silver In My Mother’s Hair was released. An article appeared in a newspaper entitled Osmond Brothers Record First Record Album for MGM Records. The Osmond Brothers recorded The Travels of Jaimie McPheeters, The Little Drummer Boy, Christmas Means More Ev’ry Year, Winter Wonderland, Silent Night, Deck The Halls, White Christmas, The First Noel/O Come All Ye Faithful for their forthcoming album, We Sing You A Merry Christmas. Note: The Travels of Jaimie McPheeters was a single that was released in conjuction with the TV series. It was not on an album. The single was released in October 1963. An article appeared in the Deseret News and Telegram about the Osmond Brothers and other stars visiting Utah to promote the TV series, Travels of Jaimie McPheeters and the Andy Williams Show. An article appeared in the Standard Examiner about the Osmond Brothers visit to Ogden. The were named Mayors for the Day and were each given gavels from the Ogden Mayor. The Osmond Brothers recorded Jingle Bells, Santa No Chimney, O Little Town of Bethlehem, and Joy To The World for their forthcoming album, We Sing You A Merry Christmas. The television adventure series, The Travels of Jaimie McPheeters debuted on ABC-TV. The Osmond Brothers did not appear in this episode but you can hear them singing the theme song on the closing credits. The title of the episode was The Day of Leaving. There were a total of 30 episodes produced and the Osmond Brothers were in nine of them. The Travels of Jaimie McPheeters aired on this date with the Osmond Brothers cast as the Kissel Brothers. Alan was Micah, Wayne was Leviticus, Merrill was Deuteronomy, and Jay was Lamentations. The leading role, Jaimie McPheeters, was played by Kurt Russell. The Brothers sang For He’s A Jolly Good Fellow. The title of the episode was The Day of the First Trail. This was the 2nd episode of the series. The Osmond Brothers appeared on the Andy Williams Show on this date. They sang Keep Your Eye On The Girlie You Love. Janet Leigh and Art Carney were also guests on this show. The Travels of Jaimie McPheeters aired on this date. The title of the episode was The Day of the First Suitor. In this episode, the Brothers had their first speaking roles as their characters were getting their hair cut. 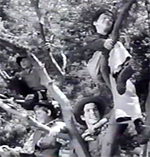 The Brothers sang and harmonized Yankee Doodle Dandy.This was the third episode of the series. The Osmond Brothers’ The Travels of Jaimie McPheeters / Aura Lee was released as single. The Osmond Brothers appeared on the Andy Williams Show on this date. They sang O Shenandoah and then I'm An Old Cowhand with Andy. Lee Remick and Joey Bishop were also guests on this show. The Osmond Brothers appeared in the Travels Of Jaimie McPheeters which aired on this date. This episode was entitled The Day of the Taboo Man. This was the 7th episode of the series, but only the third episode that the Brothers appeared in. The Osmond Brothers did not appear in every episode, but could be heard singing the theme song on the closing credits of every episode. In this particular episode, it opened with Jay’s character, Lamentations having a pot stuck on his head with Dr. McPheeters trying to help him. The Brothers sang On The Banks of the Sacramento Shore. The Osmond Brothers appeared on the Andy Williams Show which aired on this date. They sang By The Light Of The Silver Moon and then Sweet Kentucky Babe with Andy. Jane Wyman, Ernest Borgnine, Carl Ballentyne, and The Good Time Singers were also guests on this show. The Osmond Brothers’ album, We Sing You A Merry Christmas was released. The Osmond Brothers appeared in the Travels of Jaimie McPheeters which was aired on this date. The episode was titled The Day of the Giants. This is the 4th episode the Brothers appeared in. The Brothers sang I Am Bound For The Promised Land. The Osmond Brothers appeared in the Travels of Jaimie McPheeters which was aired on this date. This was the 5th episode the Brothers appeared in. The title of the episode was The Day of the Long Night. The Brothers did not sing in this episode. They also did not have any speaking parts. The Osmond Brothers appeared on the Andy Williams Show which aired on this date. Other guests included Buddy Ebsen and Peggy Lee. They sang Be My Little Baby Bumblebee and then Just A Song At Twilight with Andy Williams. The Osmond Brothers performed in Ft. Wayne, Indiana. The Osmond Brothers appeared on the Andy Williams Show which aired on this date. The Osmonds performed The Old Man Auctioneer and then sang Sweet and Low with Andy. Phil Harris, Lawrence Welk, and The Goodtime Singers were also guests on this episode. The Osmond Brothers appeared in the Travels of Jaimie McPheeters which was aired on this date. The episode was entitled The Day of the Flying Dutchman. This was the 6th episode in which the Brothers appeared in. The Brothers sang O Shenandoah. The Osmond Brothers were guests on the Andy Williams Show which aired on this date. The Brothers sang Santa, No Chimney and then Donny sang You Are My Sunshine. Don Knotts, Roy Rogers and Dale Evans were also guests on this show. The Osmond Brothers appeared in the Travels of Jaimie McPheeters which was aired on this date. The episode was entitled The Day of the Pawnees (Part 1). This was the 7th episode the Brothers appeared in. The Brothers sang Hey Diddy Um Diddy Um Day. Also in this episode, a stray dog appeared in camp and the wagon master ordered Jaimie McPheeters to get rid of the dog before they headed out to their next stop. Jaimie got the Kissel Brothers (the Osmond Brothers) involved in losing the dog. Watch the video to see what happens when the short straw is drawn. The Osmond Brothers appeared in the Travels of Jaimie McPheeters which was aired on this date. The episode was entitled The Day of the Pawnees (Part 2). This was the 8th episode the Brothers appeared in. The Brothers sang How Gentle God’s Command.